A few weeks ago at Flying Fish Coffee in Mt. Pleasant, I sat down with Sam Phillips and Aaron Ginns. Sam Phillips is the Co-founder of Split Tape, and Aaron Ginns is a member of numerous bands signed on the label. 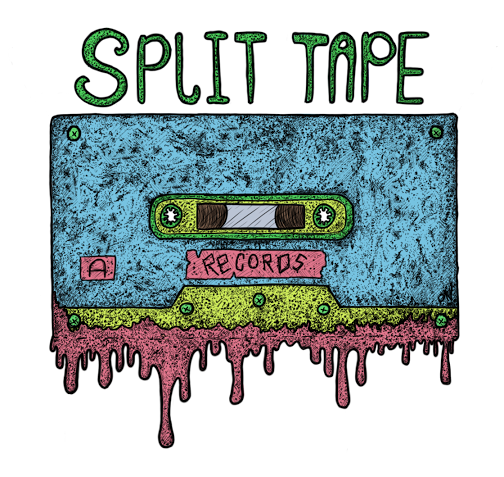 Split Tape has a reach all over the country, and even some bands from Western Canada. Sam Phillips is also a musician, and his band Dayze is signed to Split Tape. JO: What is it like to play in a band that’s on your own label? SP: Easy (haha) I don’t have to talk to myself about stuff, you know? And the other guy in the band is also one of the people that runs the label. His name is Tyler Schroder, it’s convenient. SP: It’s definitely one of those things that you have to be in to fully experience. AG: I think it’s kind of evolved to be a very heavy on the D.I.Y. spectrum of things. which I think makes it unique and interesting. There are house shows going on all the time, there are people promoting themselves, it’s got a do it yourself kind of feel and it creates a perfect community. SP: The only thing that makes it easier is record stores being here, and other resources like that. Most labels just need the internet, it doesn’t matter where you’re based. You have to be based somewhere with people. We probably won’t still be in DC in 5 years, but we always have DC roots The reason that I run a label came from growing up in DC. Around 14 or 15, I used to go to record stores in Adams Morgan and look at stuff. It got me into the whole vibe of what that is and what it’s about. I wanted to be a part of it, and it didn’t seem like something I couldn’t accomplish. AG: I think that’s a great by-product of the D.I.Y. community. JO: Do you think there’s a strong sense of community in DC? SP: Yeah, you know the other day we were dropping off posters for a show, and two of the stores we went into I’ve known both of the guys. They’ve worked there for a couple of years so it’s nice to walk in and know them. It’s cool when people know each other and obviously know other people who are into the same kind of stuff. Even if it’s not the same kind of music. JO: I’ve noticed that a lot too. In DC it doesn’t matter necessarily into the music, you still support it. Live music is a very big thing in every major city, but I’ve seen how enthusiastic the scene is here. Do you feel like DC music is growing right now? SP: I’d say it’s growing again. It definitely hit a peak in the 90s, and early 2000s. Back when Dischord was a big deal, and all those bands. After the 80s movement of punk here, but then it kind of died off.The only person I can think of who came from DC in the early 2000s to now is Wale, the rapper you know? (laughter). I don’t know what else existed here then, but around 2010 it had a resurgence. JO: What advice do you have for bands trying to break into the DC scene? SP: Oh okay, so for bands trying to break into literally ANY scene, this is super important. You should record your set. Play it to yourself, with your phone or whatever, or something. Record it, listen to it, and if you get bored at any point, go back and work on it until you like all of it. Make sure whatever you’re doing, you think it’s good. Don’t assume it’s close enough and other people will like it because they won’t. Also, if it’s not there in a band, you can either keep going and flounder around, or probably end it and try something else. A lot of things I see are people that get along really well, I know a lot of bands like this. We got along great, but that didn’t matter. We just didn’t work together musically. I think you need to find the people you work with the best musically, not necessarily your best friends. Work with them, refine it, play it over and over alone. Show other people after it’s perfect for you. Also, if you’re on a label, don’t expect the label to do 100% of your promotion. It’s like a 50/50 deal. You have to promote yourself. What are your favorite local spots to play? AG: I like the places on U Street. Velvet Lounge, DC9, that’s what I think of when I think of staple DC places. We were walking down U Street yesterday, looking at these places from the outside, you wouldn’t even know there was a music venue in there. It’s these plain buildings, I’ve got a strong adoration for these dive bar type places. There’s a real culture to them and the real DC music being played inside. Split Tape records is based in DC and at Miami University in Oxford, Ohio. Split Tape is owned and run by Sam Phillips and Tyler Schroeder.